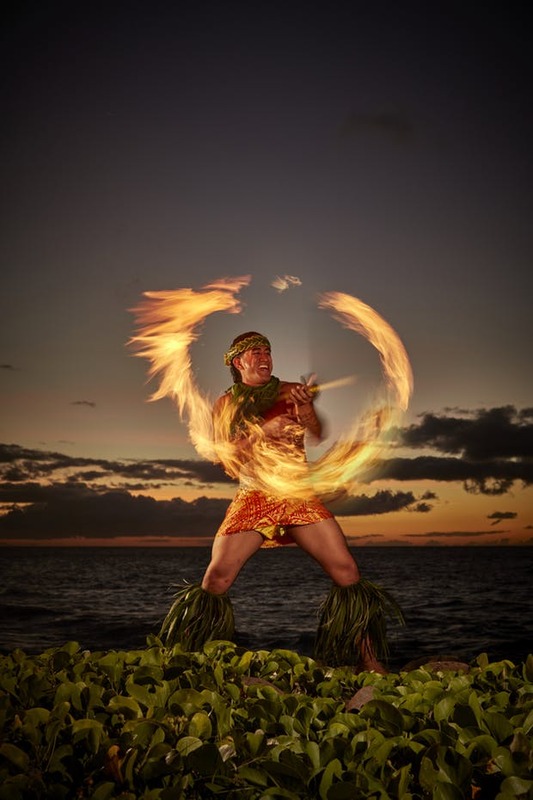 August 11, 2018 /in Blog /by Andrew S.
I saw Don Lax perform for the first time at the Four Seasons Resort Maui with Vance Koenig on guitar. For over 20 years, this talented duo have created music together on island. 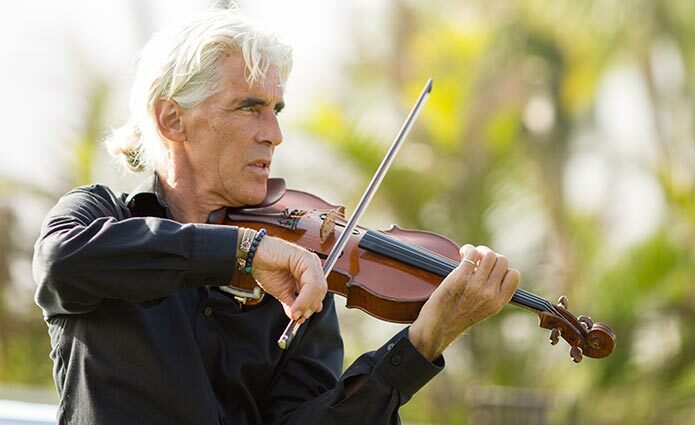 Don regularly performs at the Four Seasons Resort Maui and other venues as well as private house concerts. He plays solo and with other musicians for certain events. He is a poet and published author and writes one new poem daily and shares it on his Facebook page. 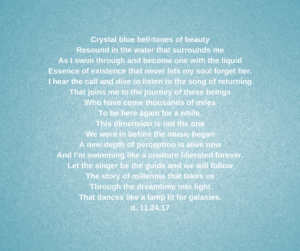 His book of poems is entitled Lovesongs for the Soul: A Spiritual Journey. Both Don’s music and book can be purchased on Amazon. Don is an ordained minister and officiates at weddings in the most creative way, by incorporating his violin along with Kristine Snyder on classical harp, and many other musicians. They make beautiful music together. Kathy: You told me that as a young child, you lived abroad outside of the US. Tell us about your childhood and the countries you resided and how the experiences shaped you musically. Don: I grew up in Karachi Pakistan, Bombay India, Paris France and Rome Italy. The good thing about France and Italy is that I got to attend two of the best music schools in the world – the Paris and the Rome Conservatory. Once I got out of the Rome Conservatory I joined a progressive rock band and started writing music and improvising. Kathy: You must have had a great deal of talent at a young age to get accepted to two of the top European music schools. Who were your musical influences and inspiration? Don: My father’s parents were Romanian. He was born in Detroit and had pure Romanian blood. That is where my gypsy vibe comes from. My musical influence began when I was five years old, in Karachi Pakistan. 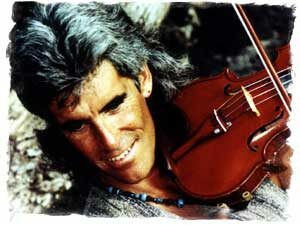 That is where my mom took me to see this gypsy violinist play. I remember walking into this big tent and down the middle of the aisle when I saw this woman. I knew right away I wanted to play that kind of music on that instrument. So I went home and wrote a letter to Santa Claus asking for a speedboat, race car, scuba diving outfit, motorcycle, like ten impossible things. At the bottom of my list I wrote: “violin.” I figured if I wrote all the impossible stuff first, I would get what I really wanted. It worked. I got a violin under the Christmas tree. 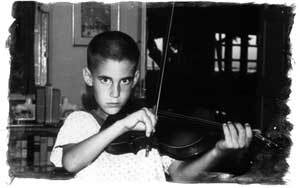 While we lived in Pakistan, I began learning the violin starting from age five. My father had played when he was a child, so he bought himself a violin too. He gave me my first couple years of lessons. Then we moved to India. India for me was literally like going from the desert to the ocean. Karachi was not thanice of a place. Bombay India was so rich, so full of life. There were so many cultures coming together. Duke Ellington came to Bombay to play a series of concerts. My father invited him and his band to our house for tea. He also invited a bunch of classical Indian musicians who played ragas and sitars and tablas. All the musicians spent the afternoon with us jamming and improvising. I was nine years old. This was my first real experience with brilliant musicians being completely in the moment, creating on the spot. It changed my life. I knew then, that I wanted to grow up and be creative. I didn’t just want to play the notes. In Bombay, I had an Indian violin teacher. She taught me the classical way. I was exposed to sitar players and jazz musicians, too. I really wanted to do different stuff. It wasn’t until I was in high school that I started breaking out and playing rock. I was influenced by Stephane Grappelli, the great French jazz violinist. I finally got to jam with him when I was in my early 20s. I got to play with some really amazing musicians for which I am grateful. Growing up, my dad and I were not always on the best of terms. He wanted me to fit into society and I didn’t. We often disagreed but in a lot of ways we were both the same in that we were both really creative people. He originally was a poet and musician before he got into a different career after World War II. I think part of his frustration was that I was doing what he really wanted to. 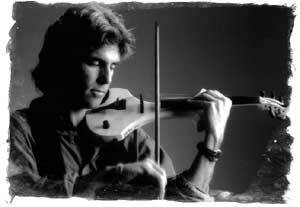 My dad did drive me to pursue the violin and eight years before he died he became my best friend. He started really sharing his stories about what he had done in his life. Kathy: So in the end, it sounds like your dad was really proud of you. Don: Yes, in the end he was because I stuck to it. Kathy: You have a strong spiritual base. I see you have a gentle soul. You are attracted to the mystical. When did you develop this sense? Don: My mom was a big influence on me. She was the one to get me interested in spirituality by exposing me to her love of Nature. She often times took me for a swim in some desolate mountain lake in the wilderness. We have a cabin in the Sierra mountains right on the border of Desolation National Wilderness. Real remote. From this starting point, we would hike. Afterwards, we would sit on the hot rocks and my mom would look up and say, “I am one with the earth and sky.” It was a natural spirituality. My parents exposed me to a lot when we lived in India. They were really open and introduced me to Buddhism. I just reread the journal that me and my mom kept. It is dated 1963. I was nine years old and we were driving from Bombay to North India and visiting all these Buddhist and Hindu temples. There is so much spirituality in this region. The people there have been practicing their faith for thousands of years. We caught a flight on a small plane to Kathmandu to visit friends who lived there. We would visit Buddhist and Hindu shrines. It was just something I grew up with. Kathy: How long have you lived on Maui? What brought you here. What was the attraction for you. Then one summer she said, “Don, I’m in charge of the Sufi Retreat on Maui in camp Keanae. I am going to buy your plane ticket and pay you to fly to Maui for a week and play for the retreat.” I finally agreed to do it. I had never been to Maui before. When we landed on Maui, we drove straight from the airport to camp Keanae, a quiet place on the cliffs. It was so beautiful and I could look right down into the ocean. I completely fell in love. Two of the best musicians in the world, to me, were also playing at that retreat. Daniel Paul on the tablas and Priyo (Nicola Notaro) on guitar. After spending a week at the retreat, I said to myself, I could live here. They told me they loved my music and wanted me back in six months for the next retreat. So they flew me out twice a year for three years for their spring and fall retreats. After the third year I looked around me and thought, you know the economy here on Maui works for me. There are plenty of hotels and weddings here. I could make a living on this island. I had fallen in love with the island itself. Kathy: The turning point for you was that you fell in love with the island of Maui. That is why you finally moved here. Then soon after, I went to the Sufi camp and Maui for the first time. The land itself, has what they say in Hawaiian, “mana.” It has energy. I had a friend take me to Mount Haleakala early on and we drove through a moonbow. It was a full moon, so magical. During one of the first few retreats I got to witness Haley’s Comet, next to the full moon, over the ocean. The moon lit up the entire ocean and turned it silver. As the moon was setting lower into the ocean, Haley’s Comet was sitting next to it. That was a moment I will never forget. Another night at one of the retreats I was sitting underneath an ancient tree and felt the tree. I have this deep spiritual relationship with trees. As I was sitting there in the middle of the tree canopy there was a triangle opening. I looked at the triangle and there was a star in the middle of it. I looked up and there was a star in the center. I knew that star was like me or where I had come from. I felt the star vibrating all the way through me and through the earth. I felt the earth also vibrating through me back up to the star. The earth spoke to me and said, “This is where you belong.” My whole life I have traveled the world. I have never had this kind of experience. It resonated loud. The earth spoke to me once, loud and clear. I am here on Maui and I definitely have gotten to know my water nature. I love to swim with the dolphins and whales. I am an ocean person. I was always a swimmer. In California, I was a downhill skier but when I moved to Maui, I realized that I needed something new because I wouldn’t be downhill skiing anymore. So I got a hand board and taught myself how to body surf big waves. I try to get in the ocean every day. 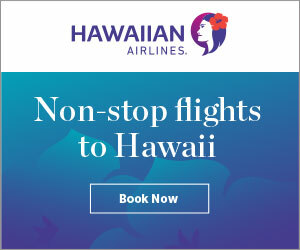 If there is no surf on Maui, I will swim long distance and go out about two miles from the shore to swim with dolphins, whales, Eagle rays and manta rays. Whatever creatures I see out there I swim with. I love moving my body. Both my parents were champion athletes. Twelve years ago, my mom won the hour long swim. She placed first for her age group, 70 and above. At the time she was 86 years old. Today she is 98 and doing great. My father was a champion rower in France in the 1950s. My parents met while they were both downhill skiing. My family were always outdoors staying active, skiing or hiking together. Kathy: Don, tell us more about your healing sound meditation gatherings. Don: It is interesting, when I lived in Eugene, Oregon in my late 20s I had been playing in these rock and jazz bands. I decided to go back to music school and enroll at the University of Oregon. They had a great music department and a wonderful teacher. I decided I needed to retrain my classical chops. When I was touring with rock and jazz bands, I always took the Bach classical Sonatas with me. It is one of the hardest things to play on the violin solo. I did this to keep me pure. I love to improvise, but you need to have a certain kind of strength and focus to actually play the violin well, in tune and beautifully. My first lesson with this teacher brought tears streaming down my face. He knew exactly what I needed. I went back to school at the age of 28. I had already done the Paris and Rome Conservatory and played major upper level academics in music. Now, after my first year at that school I wanted to do music therapy and sound healing for my thesis. I wanted to discover how music relates to colors. There is a color for frequencies, there is a color for every musical tone, and you can do healing with it but this was many years ago. Kathy: You were ahead of your time, right. Don: Yes, the only degree you could get in music at the time was based on B.F. Skinner behaviorism. I had no interest whatsoever in pursuing a career in behavioristic music therapy – “we can make a few people feel better by changing their behavior”, so I kind of dropped it. It wasn’t what I wanted. But now there are whole schools dedicated to sound healing. About five years ago, I realized that I needed to move away from just playing at the Four Seasons and begin to use my healing abilities. There was this small group of eight people and we were having a full moon thing and it lead to sound healing with the violin. I asked everyone to OM together. I played the music to their chakras and wove their souls together into one harmony. Everybody started out as separate individuals then ended up as one beating heart, one song. This can change your life. 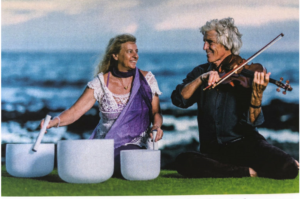 Then a year later, I met this woman Denise Kusmit, she has been doing vibrational healing using everything from sound, to crystals, to hands on. She is also a Shiatsu massage therapist at the Fairmont Kea Lani Maui for 20 years. She has been on Maui for about the same amount of time as me. 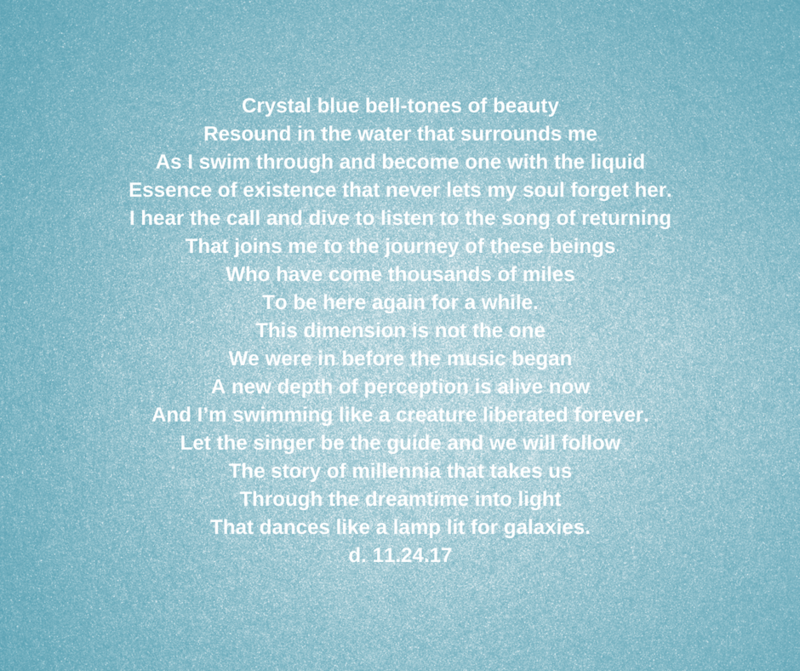 Her crystal bowls are tuned to the frequency of 432. I worked with her to create the musical chords so she can play them musically. We have made three musical CDs. Our CD’s are available at our Sound Healings, every other Monday night at the Wailea Healing Center. We’re working on making a video. We have been doing the New Moon and Full Moon Sound Healing Ceremony for over 5 years together. I start by leading people into a meditative state, then in our private thoughts we set an intention. Together we OM or use some sound in unison. This changes every time, but that is the basic format. The idea is to get people to vibrate their own bodies. Once we are in a meditative state, Denise plays the crystal bowls starting from the lowest note going up the scale and up through the chakras. I play along visualizing the color that goes with each chakra. The second part of our meditation we do what is called “soul weaving.” I have had this ability since about the age of 18 or 19, maybe I had it before, but I didn’t know about it where I can listen to a person and play the music of their soul. I can hear a person’s song and play it back to them. People have had healings or past life experiences and different things when I do that. I am playing the song of the heart and soul of the person. 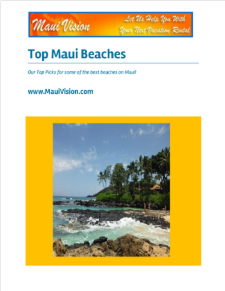 Claim your free PDF of our Top Picks for Beaches to Visit on Maui! We dislike spam as much as you do. We will never sell or trade your information. Maui Vision is about Customer Care and the Aloha Spirit Privately owned properties for every taste and every budget Luxurious, clean, comfortable accommodations in Kihei, Maalaea, Haiku, Lahaina and Ka’anapali – Maui, HI You choose the home or condo that works best for you. We reserve the condo of your choice. Visit our Vacation Rental section to View all properties. We offer studios apartments, one and two bedroom condos, plus homes that will accommodate 10 people Many of our homes are ocean view or ocean front properties With Maui Vision you know exactly what you are renting. Click here to purchase Kathy’s artwork on greeting cards!